If you’re looking for the most adventurous tour that will give maximum highlights of the Garden, plus give you a chance to try a little off-pavement mountain biking, then this guided tour is for you! Our Adventure Tour is a 2.5 hour complete outdoor experience through the Garden of the Gods Park. Included in the tour is the use of our premium upgraded fat tire bikes which are always head turners, and are both easy and fun to ride. in addition to covering the 2 main paved road loops included in our Sightseeing Tour, we’ll take riders onto a short section of a 4 wheel drive road in the park where you‘ll get to experience how our fat tire e-bikes perform in the dirt! You’ll breeze up the hills under electric assist, and capture a view of the park that most visitors never see. We’ll take you to a hidden spot with spectacular rock formations, giving you unique photo ops so you can show off just how awesome you are on your fat-tire bike! If time allows, we also add the Roller Coaster Loop which is a bike path that is super fun to ride, and takes you to another little-known overlook of the park. Like all our tours – Smiles are Guaranteed - but smiles on this tour may be just a little bit bigger! Difficulty: Recreational Intermediate (6/10) Paved roads with bike lanes, paved and dirt trails, dirt roads. Hilly terrain on and off road, but fairly easy riding up hills with electric assist. Faster riding pace, 50% longer distance, may experience heavy vehicle traffic. 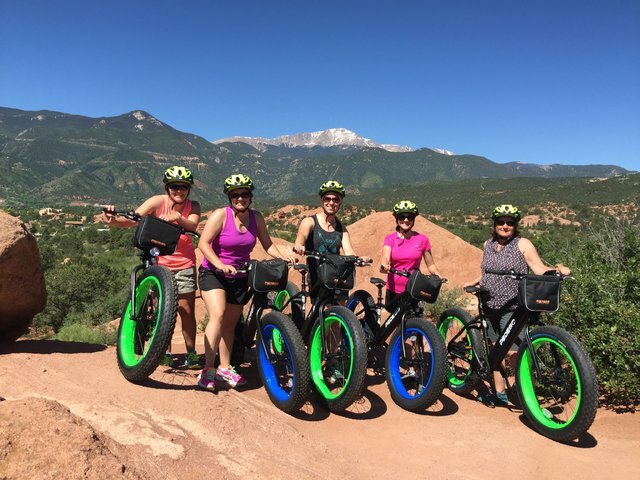 Options: This tour includes the use of our upgraded premium fat tire electric bike, but other options such as premium Smart Helmets (intercom between your group of riders) and other items may be available for an additional charge. Rider Requirements: Ages 14+ as riders, 5+ as passengers, 250 lbs or less, and must wear fully closed shoes. Must have some experience riding bikes, and be able to demonstrate confident and safe riding ability.